The two men approached the field, the designated area for the final battle. They both had hard and ready looks on their faces. Neither was playing around. The blond on the right in insanely exaggerated clothes spoke first. "I am the most feared, loved, and revered wizard in Ingary," Howl said, crossing his arms like a most evil sorcerer. "And I am the most cruel and heartless tyrant that ever lived." "I eat girls hearts three times a day, with toast." The wind buffeted around them. They watched the other, each looking for a sign or hint of weakness. "What a lie that was!" they both said quietly under their breath at the same time. They blinked, then straightened, staring at each other curiously. "Do I know you?" Howl said. Eugenides took a few steps forward. "I don't think so, but I somehow feel I should know you." They considered each other for a few long moments. "I'm a slitherer-outer," Howl said at last. "It's one of my best skills." "If I could, I would never kill another in my life," Eugenides said. "...So how exactly did we end up as the final two?" Howl said. "So... we both hate fighting, and will do just about anything to get out of it, right?" "So," Howl said, "do you want to go find a pub or something instead?" Eugenides looked at him, the strange word foreign to him, but somehow sounding right up his alley. Seven drinks and a bread basket later, they were talking like they'd known each other all their lives. "I'm tellin' ya," How said, his voice slurred, "it's no picnic, being the king's wizard. Always 'do this' and 'transform that.' Not what I signed up for when I started all this." He waved his arms around, almost knocking a bottle off the counter. "King's wizard? What about being king? Do you know hard it is to coordinate three countries to make peace, plus performing every maneuver and trick I did when I was just a thief, but without a hand? And trying to get my cousin married to a decent ruler? Don't talk to me about pressure. No sir," he said, ending his words as he buried his face into his mug. "At least we have our fashion, and our hair. Not to mention Sophie to keep me on my toes." Howl shook his head. "No, better. My wife." Eugenides brightened. "Oh, you have one of those too?" He paused "Where would we be without our incredible, insane wives?" "Insane for marrying us?" Howl grinned. Then he sobered. "They're stronger than us, and they're just crazy enough to love us. They're lovely, aren't they? So long as they don't kill us first," Howl muttered. "Amen to that." They clinked bottles and downed another round. The sound of the pub bustled around them. After several minutes, Eugenides spoke up. "You know, I've been thinking about it. This whole "tournament champion" really isn't worth the hassle," Eugenides said. Howl lolled his head to one side, grunting for him to continue. "I mean, after it's over, what then? Always dodging another opponent who wants to take back the title, and I'm not so sure I could get so lucky the next time around. We left a lot of nasty people behind us, you know." Howl's eyes, glazed over, blinked a few times to process the information. "And then there's the endless parades and banquets and ceremonies. Never having a moment's peace. Can you imagine how many hospitals they'd want you to open? It would be insufferable. No, I may just give you the title, my friend," he said, drinking another. "No, just looking at you, I'm sure you could handle it. In fact I'm confident you could. I mean, just look at you. You got this far with only one hand. In fact I'm so sure, why don't you just take it right now?" Gen looked at him from the corner of his eyes. "Well," he said, his words rather slurred himself, "if you're sure..."
"Quite sure, my friend," Howl said, standing, a lot brighter than he was moments ago. Bumping into chairs and tables, they helped each other out the door. Howl secretly gloated over his newest narrow escape, while Eugenides mouth turned barely upwards in triumph. They made it to the open field before they each tried to stand on their own. "You may have won, but you must admit, I am better dressed, by far," Howl said. Eugenides looked him up and down and had to stifle a chuckle. With his brilliant scarlet and silver robes, edged heavily with lace and embroidered stars, it was hard to argue there. Gen glanced at his own clothes. They were grand in their own way, but served his purposes well. 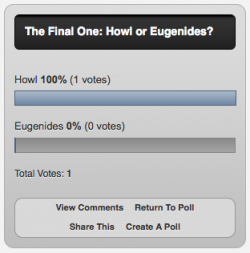 "Yes, I'll agree with you," Eugenides said. He would concede on this fact to take the title. "And devilishly more cunning," Howl said with a grin. It looked like he was striking a pose, just ready to be painted. Gen raised his eyebrows. "Oh really?" Then how was I able to steal this?" he asked, holding up a chain with a picture of a young woman inside. Howl glanced at it, smiled, and waved a hand dismissively. "Oh, that? I knew you were going to steal it, so I replaced with a potato disguised as a picture of Sophie." Gen blinked. It did feel rather lumpy, and much to heavy for a locket... then he saw the potato appear. Eugenides laughed out loud. "We are made of deeper stuff than anyone knows," Eugenides said, shaking his head. "Indeed. Now that I think about it, I do want that title. It would sound rather grand to add it after my name," he said, beaming. "With a sword? Hardly. Those things are pointy and could hurt people," Howl said. "Then I'm afraid you're at a disadvantage here," Eugenides said, grinning. He swiped at him with his hook, just to scare him. And maybe nick his clothes. But Howl just smiled and crossed his arms, taking a step back to avoid the blow. Gen's hook glanced off the clothes without a scratch. He looked down, and stared. He couldn't believe it. Howl had turned his hook into a flower. Eugenides shook his head, trying not to laugh. "Make it dark for ten seconds," he said. "Now why would I do a think like that?" "So you can see if you are really as good as you say you are," Gen said. Howl stared at him, blinked once, and it was pitch. When he put the lights back where they should be, Eugenides was nowhere to be found. Howl closed his eyes and concentrated on a finding spell. There he was, an impressive fifty yards away, hiding behind a tree. He opened his brilliant eyes. Then he made the tree disappear. Well, not really disappear, he just made it float twenty feet above the ground temporarily. Eugenides was there for a fraction of a second before disappearing again behind a new tree. He lifted the next tree while placing the other back where it should be. Eugenides twisted spun and dove from tree to tree, as fast as Howl could lift them, always just ahead of him. Howl sighed. He couldn't use a finding spell and lift a tree at the same time. So he decided to lift all of them at once. Surprise flickered on Gen's face for an instant before it vanished. Then he came at him, his sword drawn. Before Howl could react, he cut a neat slice off his beautiful sleeve. "Now that was uncalled for!" Howl said, his voice petulant and pouting. Eugenides cut another thin slice off the other one. "There, now they look just the same," he said, smiling. "You're just like Sophie!" Howl whined. He snapped his fingers and the sword was replaced with a baguette. "Hey, that's not fair. Give me back my sword and I could cut your robes to pieces." "Well, that's not very much of a reason for me to give it back to you at all," Howl said. Gen grabbed a knife from his boot and began again. "Oh, this is really uncalled for," he said and clapped both hands together. The ground exploded around them. Rubble and rock exploded around them. The dust was still settling when two pairs of footsteps approached. Irene and Sophie walked carefully between the debris, having spent a nice lunch together. They eventually found the bodies of their two husbands. Howl and Eugenides groaned and rolled over. Both of their clothes and hair were filthy and covered in dirt. Neither of the women could suppress the smiles on their faces. "So, who won?" The Queen asked mildly. "I did," Eugenides and Howl said together, and collapsed back onto the ground. Howl Jenkins is from Diana Wynne Jones' Howl's Moving Castle and Eugenides is from Megan Whalen Turner's Queen's Thief series. The winner. Taken at 9:01 PM EST. 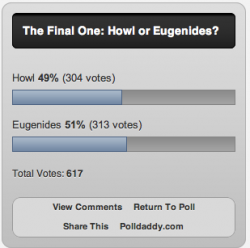 But Howl had the first vote. And here, a little fan love for all those wanting a tie. Thank you so much everyone for making this what it was!